At first glance, a tooth may appear to be simple thing. Small and solid, it may seem as complex as a pebble or a marble. But beneath the surface of each tooth (and on the surface too), are many parts, each of which has its own purpose and function, as well as its own potential problems. Enamel is the part of the tooth you can see; a hard, resilient substance that covers the crown of the tooth. Comprised of hydroxyapatite, phosphorous, and calcium, tooth enamel is stronger than bone and protects the important tissues that lay below. That said, enamel is not indestructible. There are bad habits – like chewing ice or teeth grinding – and bad substances – like alcohol or acid from certain foods and beverages – which can weaken and damage the tooth making it more vulnerable to infection and decay. Right below the enamel, you’ll find dentin, a calcified substance very much like bone. Weaker than enamel, it is more vulnerable to tooth decay, especially where the enamel has been damaged or weakened. Dentin contains small hollow tubes and canals. If you are experiencing tooth sensitivity, it could be because those tubules have been exposed due to enamel loss and cold or hot substances are hitting the nerves inside your teeth. This hard, connective tissue covers the root of the tooth, helping to anchor it to the bone in your jaw. Cementum is particularly vulnerable to gum problems, since it is usually covered by the gums. 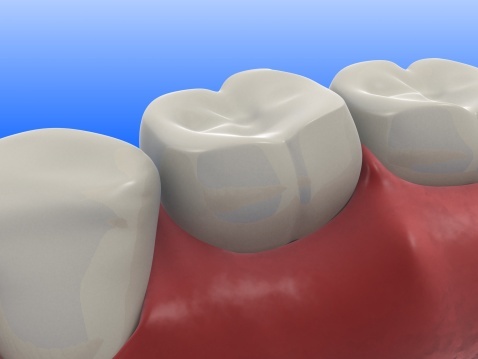 If your gums become infected or diseased, your cementum could be exposed to the same harmful plaque and bacteria at fault for that, weakening the bond between tooth and bone. Deep in the center of the tooth lay the pulp. The pulp contains the blood vessels, nerves, and other soft tissues that deliver nutrients and signals to your teeth. If your tooth is infected and decays, bacteria can infect the pulp, leading to a condition called pulpitis which can manifest itself as a toothache, throbbing, or hot and cold sensitivity. One thing that all of parts of the tooth have in common is the absolute necessity of preventing infection or other damage. That starts with good oral hygiene habits and regular visits to a dental professional. The teeth are remarkable machines, but like all machines, they need to be well-maintained to function properly.